Shopping for Star Wars Sporting Goods? Golf with the Dark Lord of the Sith! Inspired by Star Wars, a plush cover for your driver. Darth Vader will watch over your other clubs, too! Fore! Put down that lightsaber and pick up a golf club, because this plush Darth Vader Driver Cover will improve your golf game. (Well, not really.) 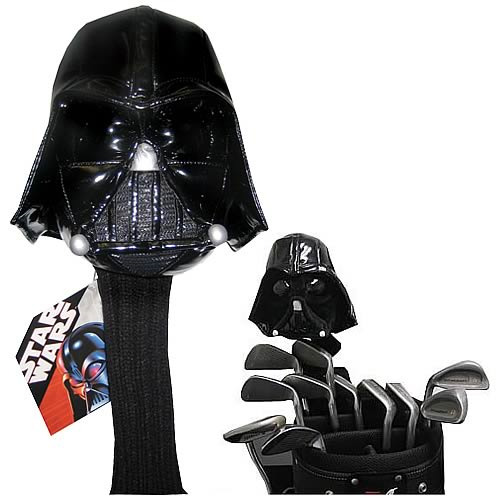 Although the hyper-villain won't help you with your drives on the fairway, Mr. Vader will certainly look cool on your Big Bertha, Sasquatch, or Cobra driver. Plus, with Vader on your side, you never need to worry about penalties again. Just have him Force choke anyone who questions you. This baby will add fun and conversation to any round - regardless of your final score! Fits all men's and women's drivers (460 CC driver head). Total length is 16-inches, including Darth's 7-inch head and a 9-inch sock.